You may remember this work from the film Mona Lisa Smile. Kirsten Dunst’s character Betty is asked what she thinks of it and she replies, “I wouldn’t even call it art. It’s grotesque.” If you, like me, thought at first viewing that this painting isn’t that gross think about the act of standing for days feet away from decaying meat which is frequently being doused in fresh blood, the scent of which blends with your turpentine. Did I mention Soutine painted four version of this? You’d never know that he was a man who would die from issues related to a weak stomach. 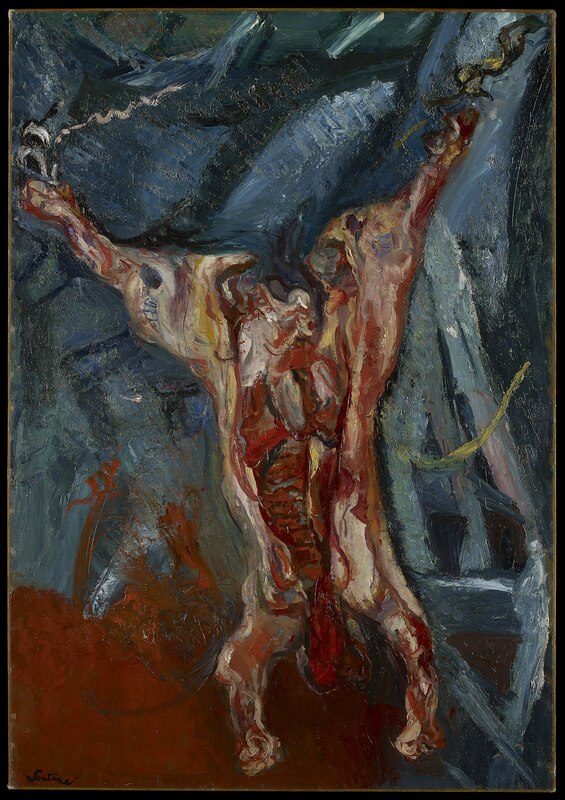 Looking at this piece it’s not difficult to imagine that Chaim Soutine may have had a longstanding beef with food. Though he was fascinated by food and frequently painted these edible arrangements, this stands as one of his most memorable and dare I say, raw interpretations. At the meat of Soutine’s obsession you find that a combination of not having anything to nosh due to extreme poverty and using what food the family did have to practice Orthodox Jewish traditions is largely to blame for his playing (or painting) with his food rather than eating it. The remains of this omnivorous obsession was based on his adoration of Rembrandt whose 1655 Carcass of Beef (Flayed Ox) was frequently salivated over by Soutine on his regular visits to the Louvre. Rembrandt’s carcass is noted for it’s vivid colors but when compared to Soutine’s, which was coated almost daily with fresh buckets of blood by his assistant, Rembrandt seems downright dull. The smell of rotting beef and fresh blood became so oppressive that neighbors called the cops who almost threw away the fermenting flesh before, what I can only assume was the Igor á la Frankenstein-esque assistant, shooed them away like so many flies covering a carcass.